And so, here goes! 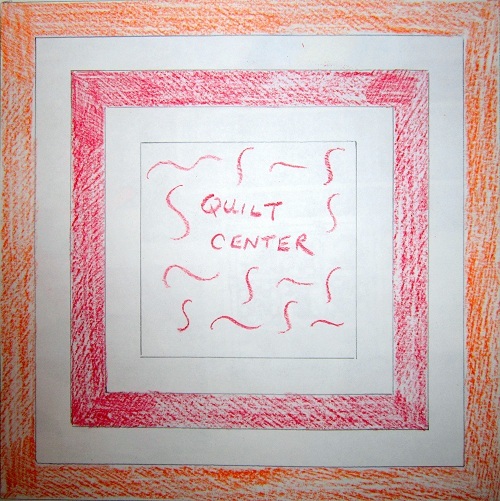 The diagram below shows a quilt center. 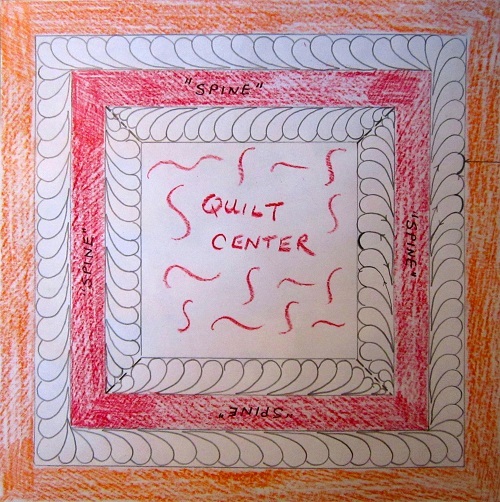 Beyond the quilt center are two white and one red sashings. The white sashings will be our quilting area. 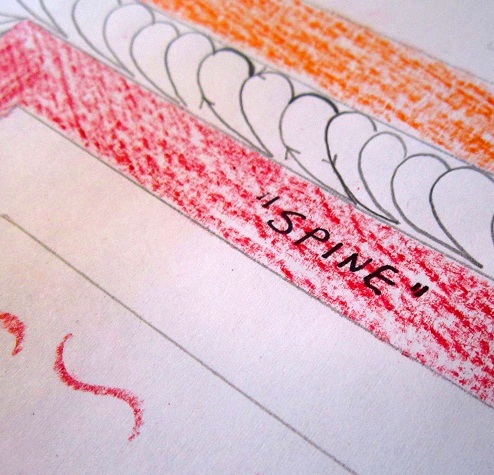 So the way we way we will treat the quilting scheme is that the red sashing becomes our “feather spine”, and we will add feathers on both sides of the spine (i.e., the white sashings). This is a free-hand exercise. You will have to be pretty comfortable with the stitching path of feathers. Click here to refresh your memory. The way we are feathering the sashings all around is actually an extension of the feather wreath I had talked about here. 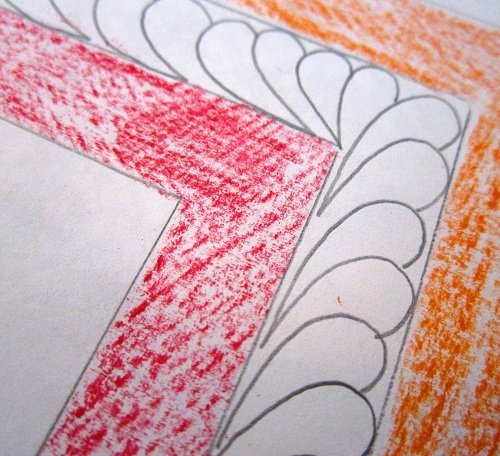 Instead of a circular feather wreath, we will have a square (also applies to rectangular) feather wreath. 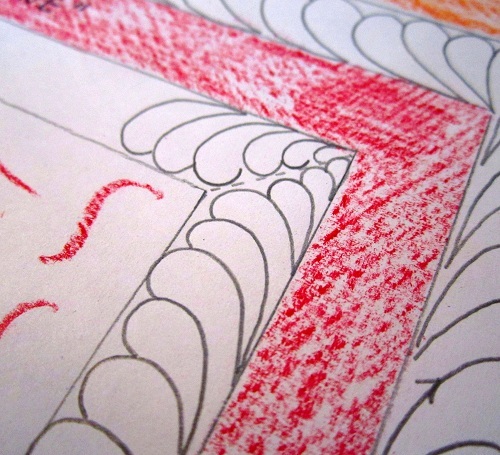 So, we will start with a partial feather since we are free-handing the feathers in the outer sashing, and will be “winging” it when it comes time for the last feather to meet this first feather– click here to see visual illustrations. 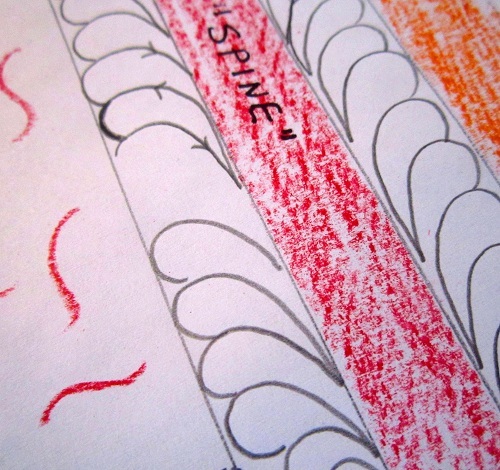 The doubly-darkened stitching path denotes stitching over previous stitches to get from one feather lobe to the next. So, we would just be filling the area with feathers, one after another. There’s really nothing to watch for when feathering the outer sashing, unlike the inner sashing. More about that later. We have now come all the way around. You see we are coming up against the first feather out with which we started. Now we are ready to feather in the inner sashing. I would start like I did in the outer sashing, and feather like normal. Until…. … I come close to a corner. You will need to miter your feathers – you will see what I mean. For this, I could draw a line at the 45-degree, or just place a piece of paper at the 45-degree spot to avoid having to draw. The 45-degree line shows the boundary of my feathers as I near and before I turn the corner. 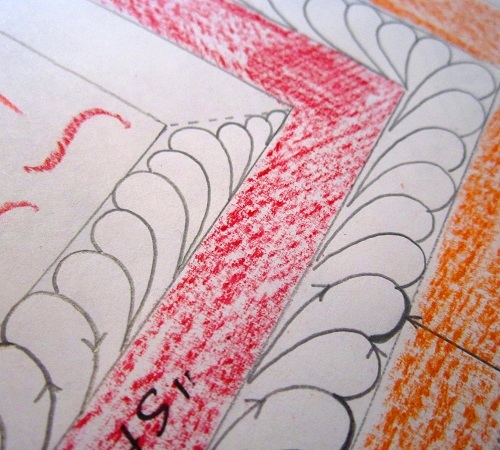 So, the feathers will decrease in size, and will start small once the corner is turned before increasing in size again. This is one crucial thing to be mindful of when feathering the inner sashing. Here you see how the feathers look in another corner in the inner sashing. And here you see the sashings all “feathered up”! Thanks for stopping by. 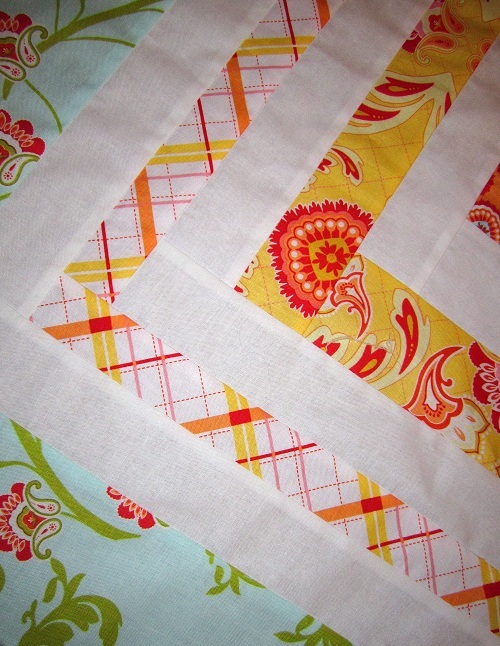 I hope my Thread Talk post helped jumpstart some quilting ideas for you. p.s. Please know that I am not ignoring, or blowing you off – I have been extremely busy, and have had only about 7 hours of sleep in the last 48 hours. I still have lots to cross out on my to-do list. I do hope to visit or email you back soon. This entry was posted in Freebies, Ideas, Tutorials, Quilting, Thread Talk and tagged Feather wreaths, Feathers, Free hand feathers, Free-motion quilting tips, Wendy Sheppard. Bookmark the permalink. WOW! I didn’t even think about corners, so you anticipated that problem nicely. Thanks for sharing your experiences. I don’t think any of us really expect an answer too often. Certainly not an answer to a comment. Your time is precious, too. I just want you to know that you have faithful readers who like to watch what you’re doing and to feel inspired to try harder and new things, too. 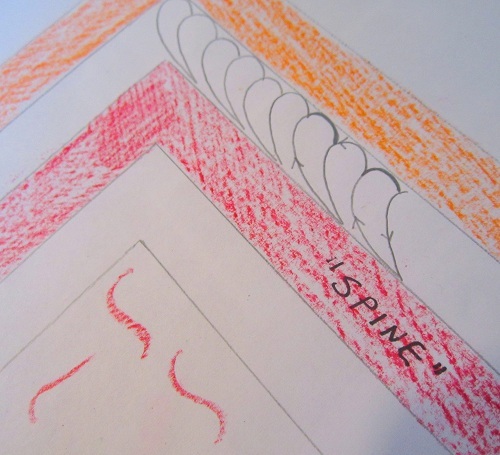 Thanks… I do enjoy your tips and tricks for fmq …. and refer back to them often…. hope you get some sleep soon…. Excellent tutorial. Thank you so very much, again! Give Ms. Baby a kiss from me. 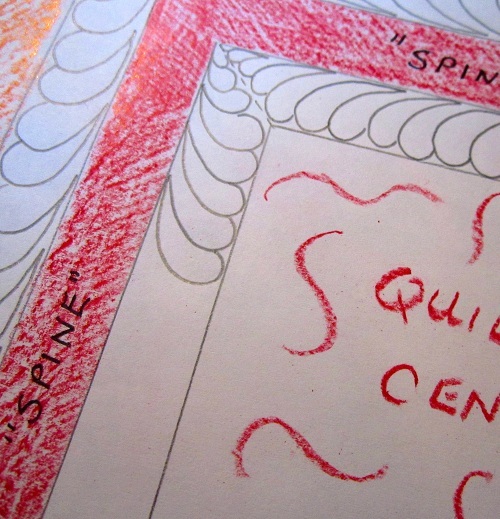 Thank you for such a helpful post on quilting in the borders! I am fairly new to this and that is so wonderful! I echo “gardenontheridge”s comment…..we are truly inspired by your creativity and talent and are so thankful you are able to share these inspirations with us all. This is an awesome ‘tute’ that can be translated in to so many different spots/quilts! Continue to take your vitamins (LOL!) and be realistic about what you (one person) can safely do, Dearheart! We love you!-D Hugs!!!! I also am really new to this and so appreciate your taking the time to explain this to us. 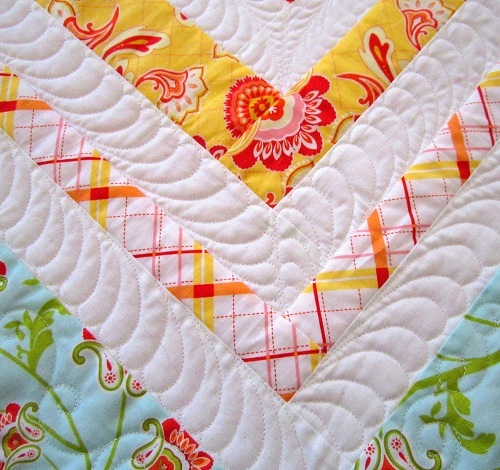 Just Beautiful….I love feathers and your quilting is gorgeous! Wendy — this was awesome ! Thank you ! Thank you ! Beautiful work! I have never done this, but would like to try. 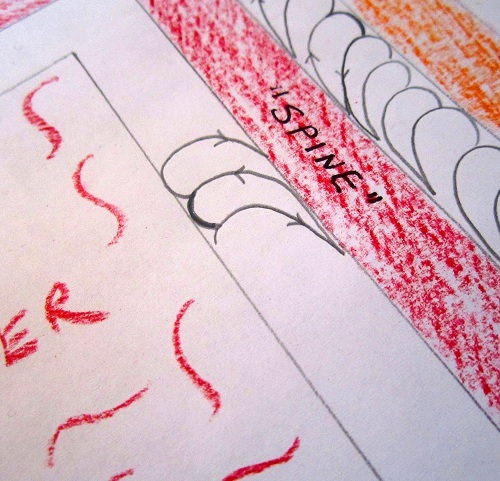 Your directions are well-written and illustrated. The feathers are done by using a regular sewing machine? 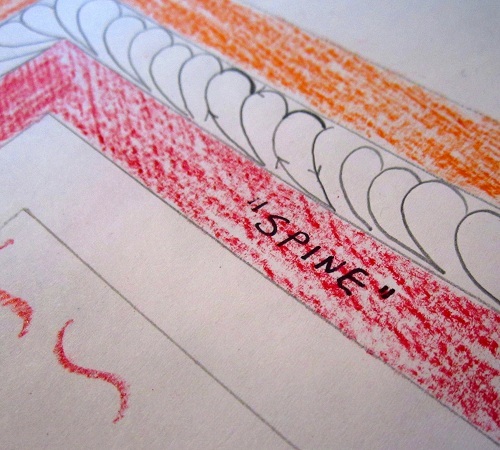 I like the idea of using the border as the spine and I live the way you handled the corners. Oops….that would be “love” the corners!!! Your tutorials are always great. Ooops…Where did you get such a link ? Server cannot locate what you are looking for! Please can you look after it? I am interested to see it. It loaded just fine at my end… weird. thanks for sharing this. I really need to sit and look at all your thread talk posts so I can get some ideas. I was just wondering why you did the inner border/sashing corners different than the outer one? Thanks for all your time sharing. It’s because of the orientation of the feathers is a bit different with respect to corner. The feathers have to “turn with” the corners or else they won’t look good… try and see it for yourself, and maybe it would make more sense to you. Wow, that sure is a smart way of wording it. Thank you for finally talking about this! You’re so beyond epic! Do you honestly think these articles being posted have really had any lasting effects on the world? I think they probably do.